The temperature is slowly rising from close to freezing. The morning is silent except for a distant wind and sporadic bird song. 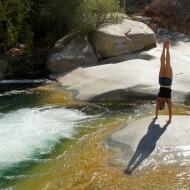 A curious little squirrel joins my yoga, also he knows where the first warming sunrays will hit camp. 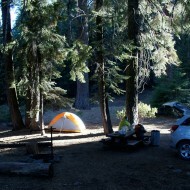 After just a few days we’re feeling very much at home in this forest of giant pine trees. 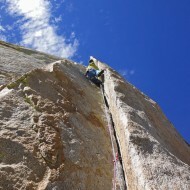 The birds and squirrels are currently our only companions at the world famous climbing spot – The Needles. 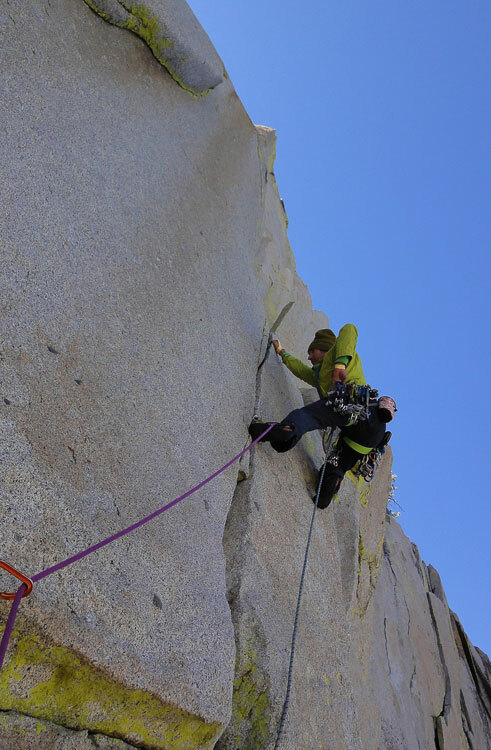 Earlier we had company of a couple of other climbers, but the second part of our stay we have not only the camp, but also the steep-sided granite domes all to our selves. It’s our first time visiting the Needles. Excitement, motivation and expectations were high before we even saw the walls, based on far-traveling stories and tales. Already on the approach you get a feeling for the rough textured and sharp, white granite, as you cross the slabs behind the Needles Watch Tower (that has recently burned down). After more then an hour of pleasant cross-country hiking, the canyon between the Sorcerer and the Witch Needle opens up to you like a gateway to a hidden, mysterious rock paradise. It hits you with a striking beauty! You’re overlooking a steep gorge framed by vertical, neon-green to white, granite walls. 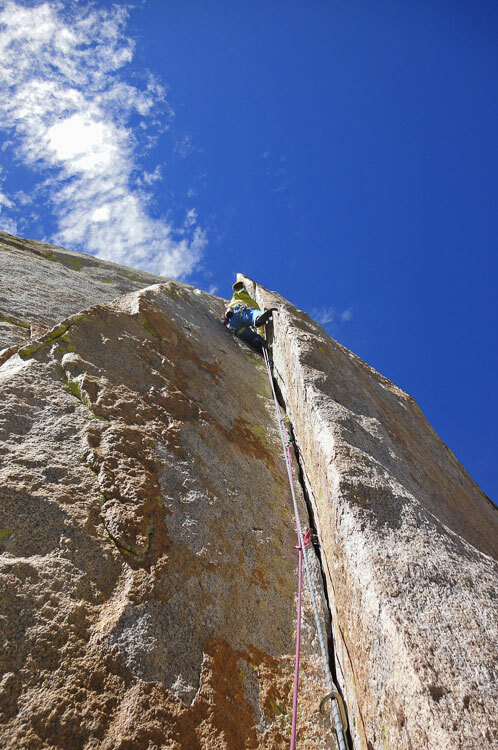 There is no need for a guide book to find the classic climbs – the perfect lines of cracks and corners are drawn out for you right there in the rock. 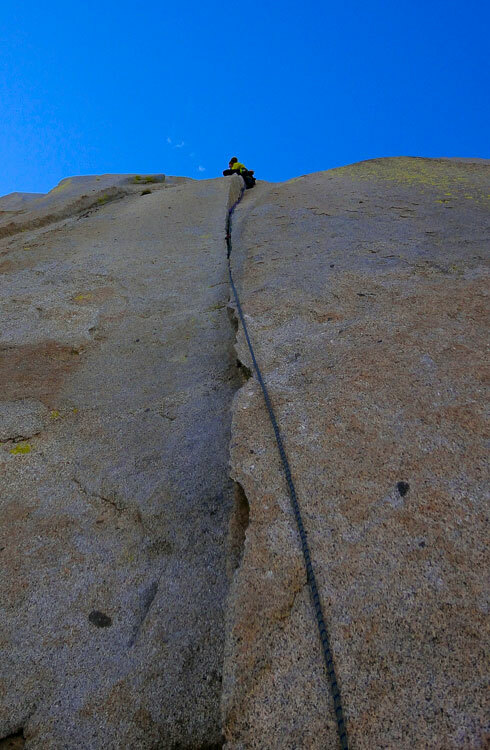 So the fun begins; preferably in the sun, which typically means climbing a route on the east face in the morning and another 3-5 pitch route on the west face in the afternoon. 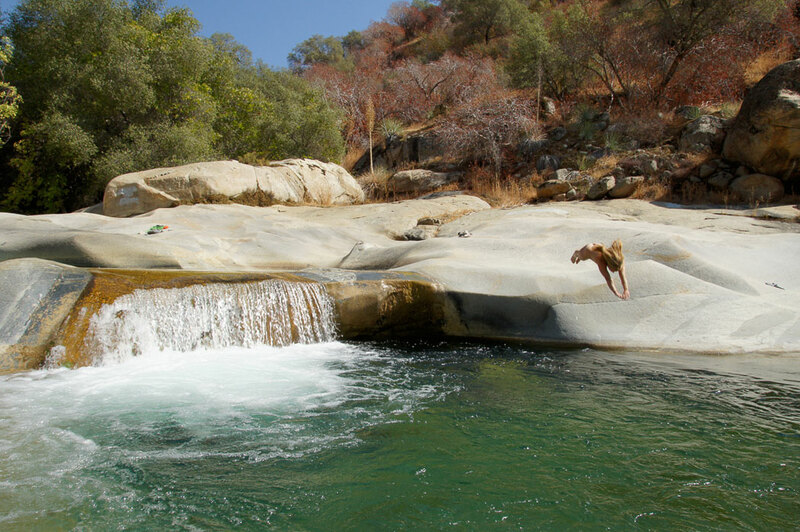 The setting is wild but peaceful. Our occasional commandoes echoes between the walls, until the afternoon wind kills the silence and boosts the wildness. Surprisingly at first, but always frightening, fighter planes regularly cut the sky at low altitude, causing a noise worse then any rock fall or thunder. I’m trying to block my ears in the most awkward ways without letting go of the rock… I guess it’s the perfect place for war games, as close to wilderness as you get these days, nobody but the trees are disturbed right? The green lichen, colouring most aspects of the domes, is neither moist nor slippery (since feeding mainly on CO2 in the air and not on water). 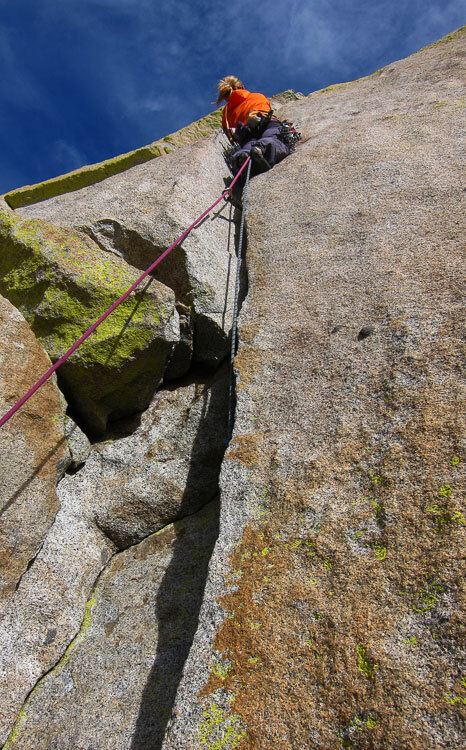 The friction is mainly good since most routes are middle-aged (a climbing route’s lifetime going from crumbly to polished), although many of them were put up already in the 70s. The rock is solid. Cracks are clean and continuos. 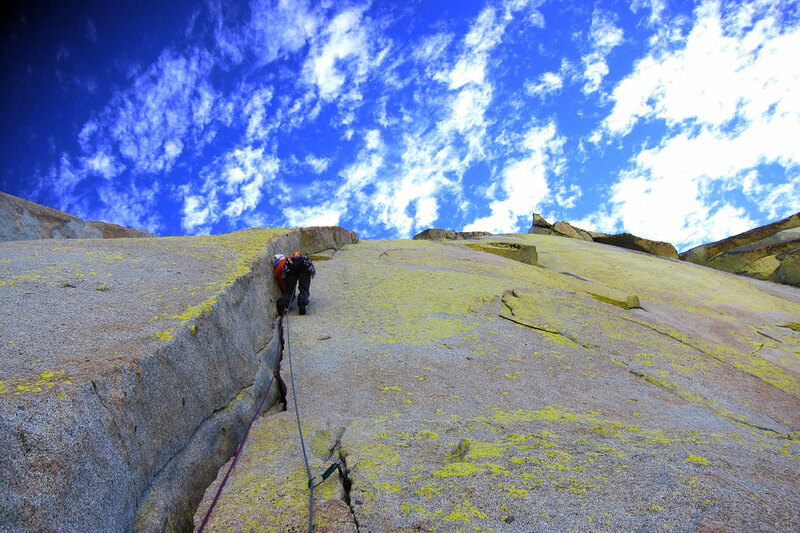 Every pitch we climb seam like a specific gift from Mother Nature to rock climbers. 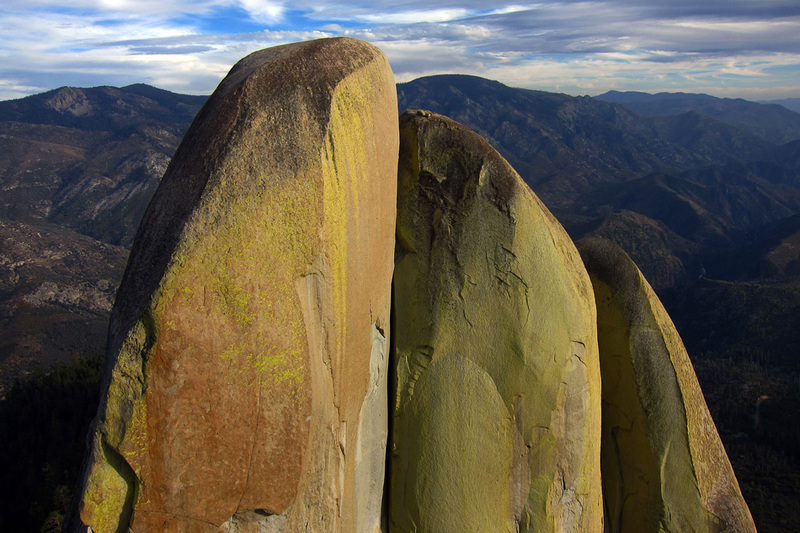 Every summit rewards you with a new panoramic view from the adjacent Needle to the high Sierras in the north-east. 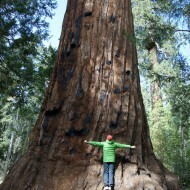 We are above 2000m in the Sierra mountain range in Southern California, in the home of the Giant Sequoia trees. The climate is dry and everywhere there are signs of forest fires. We never have campfires since the wind is always strong in the evenings. 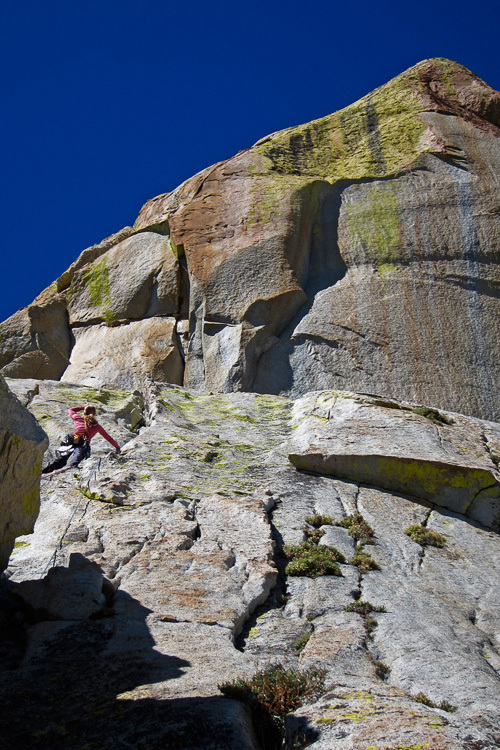 During the first week of October we find camping slightly chilly, but climbing wise it’s perfect in the sun. 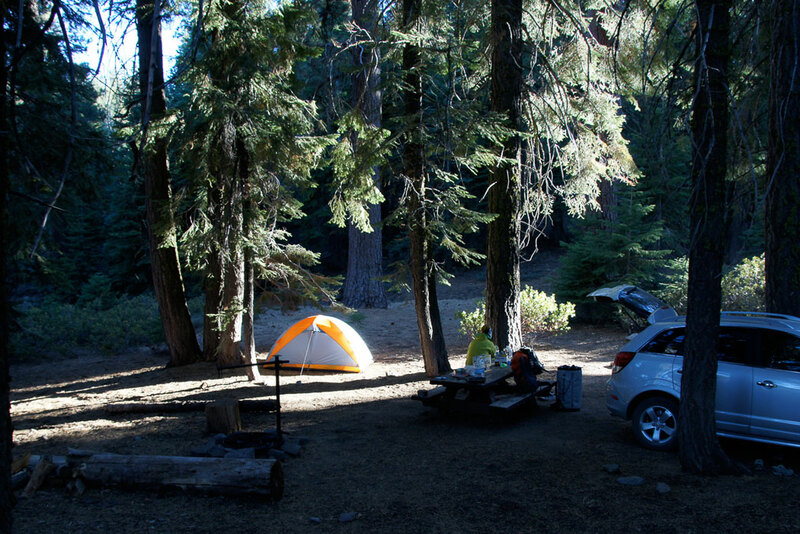 Very appreciated is the absence of the common sources of discomfort when camping and climbing; such as mosquitoes, ants and spiders, snakes, bears (although they exist they don’t seam to interact much with people), crowds, and most importantly – rain! (or maybe we were just lucky)? 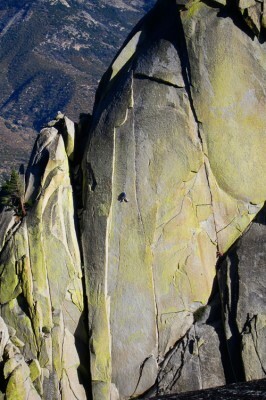 Climbing is in a way more forgiving then in Yosemite, more like European granite, because it’s very textured. 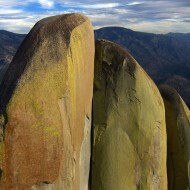 This means good friction and a large variation of footholds apart from the cracks. 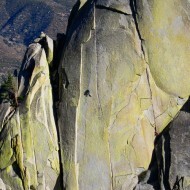 Pitches are long and vertical, often close to 50m of continuous cracks. 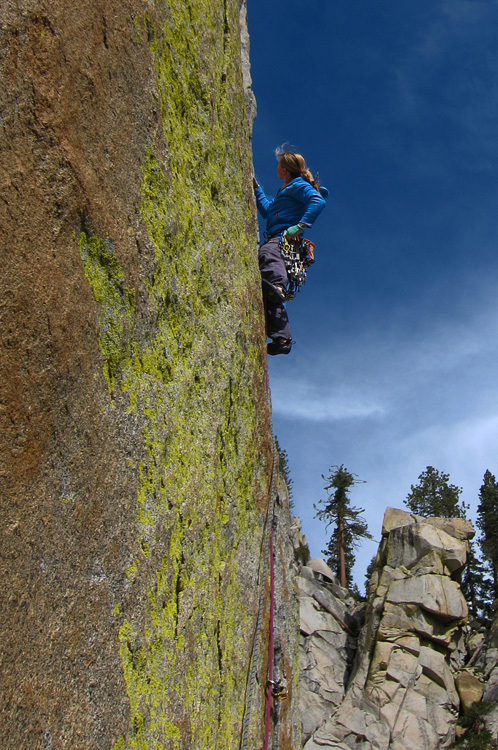 Rest days: the lodge in Ponderosa offers a friendly atmosphere with classic American food from eggs and bacon to burgers, which is ok for exhausted climbers. They also have wifi, a store with basic stuff, and gas. Camp Nelson is slightly bigger, you also find a hardware store and a lodge with showers. 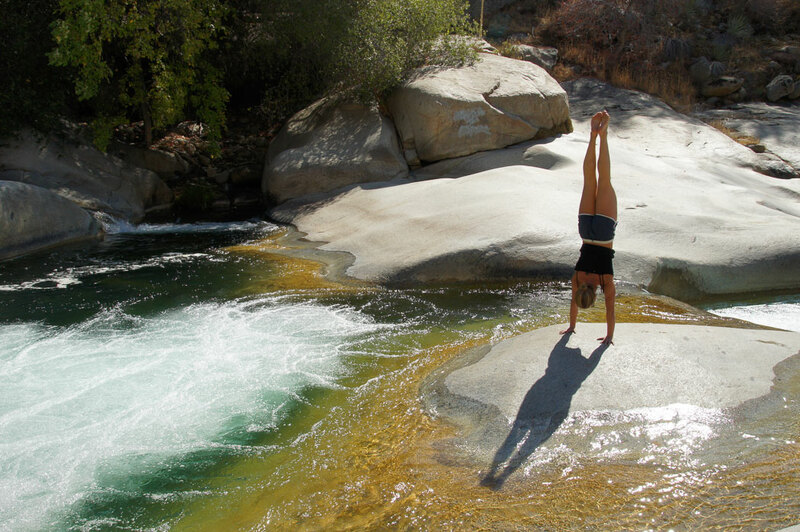 Driving about 1h down the valley to somewhere close to Springville, we found our favourite resting spot; a small river that has shaped it’s granite bed round and smooth into pools, little falls and slides – like a living water land! 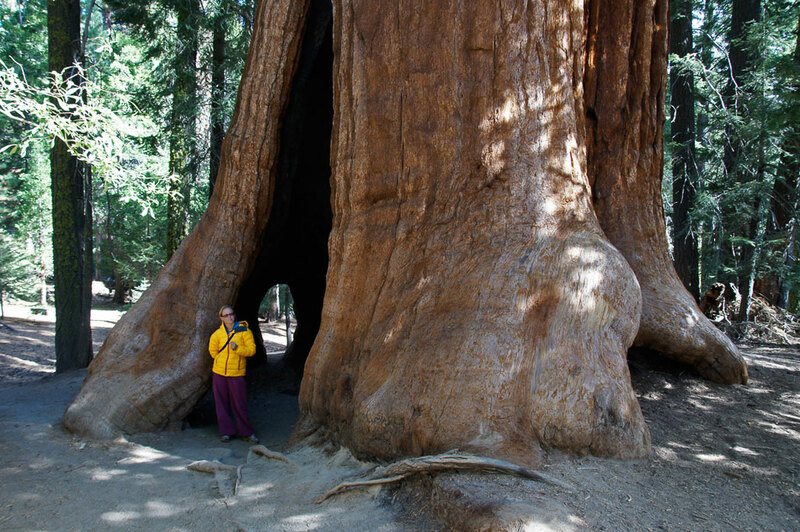 Strolling around in the National Seqouia Forest is like going back in time. 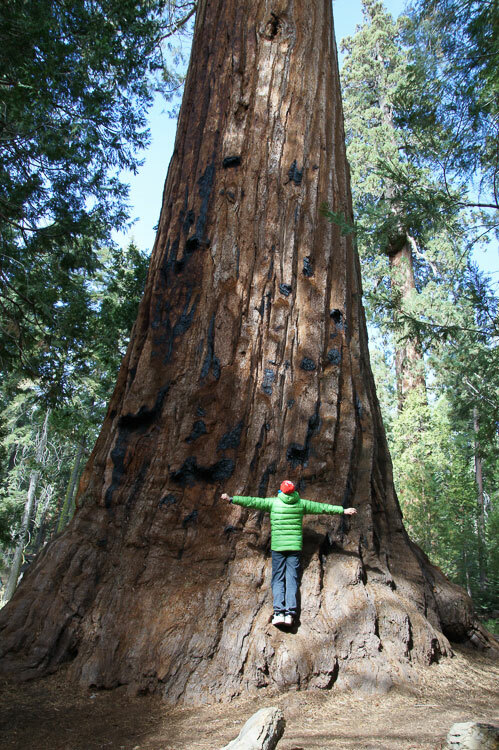 Giant Sequoia trees, soft, red, enormous, and absolutely amazing are watching over this place since 1500 years ago. 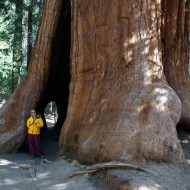 Some tourist trails have been made in areas with high concentration of giants. For a first-time visit, the clean and nice classic lines in the gorge between the Sorcerer/Charlatan and the Witch is a good start. All are well and easily protected. 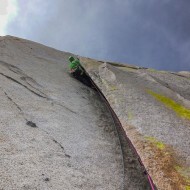 – Fancy Free on Charlatan East Face: 3 long and sustained pitches of 5.10. 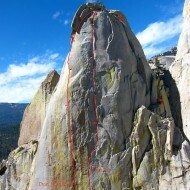 The middle changing corner pitch being the high-light, but 150m of high quality climbing. 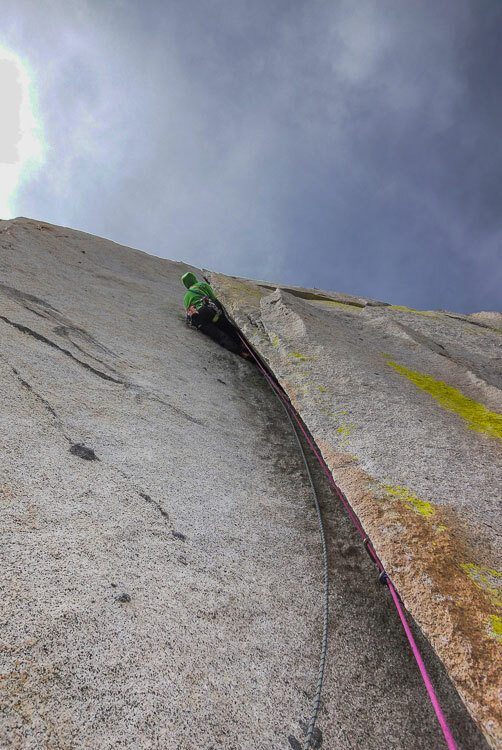 – Thin Ice on Sorcerer East Face: 3-4 pitches, with a short section of 5.10b, otherwise 5.9 to 5.10a, including a flare corner that allows you to combine squeeze, stemming and jamming deep in the corner crack. – Don Juan Wall on Sorcerer East Face: with the same start as Thin Ice, then a similar but more demanding line. And a bonus pitch in the end with a roof-corner. 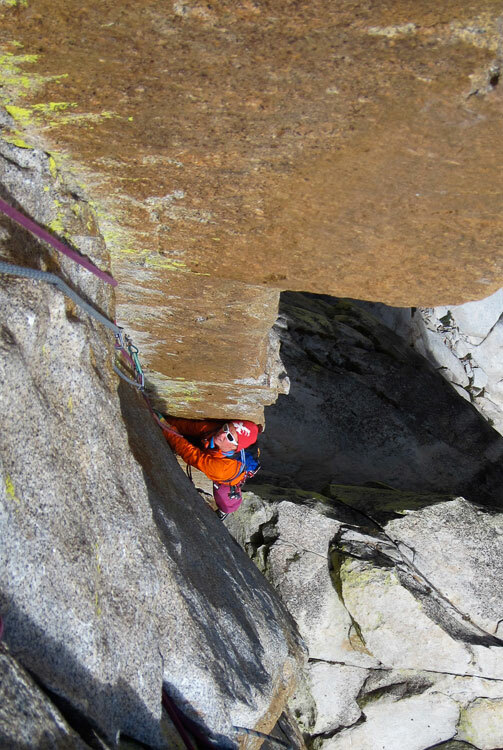 – Airy Interlude on upper west face of the Witch: 5.10a, the upper half of the route being the nicest, including an exposed hand to finger traverse. 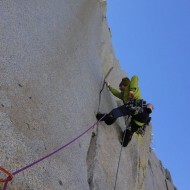 – Igor Unchained on upper west face of the Witch: 4 good pitches of 5.9 climbing. 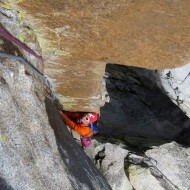 – Ankles Away on upper west face of the Witch: Starting from the ledge and easiest done in 2 pitches. Takes a lot of small gear. 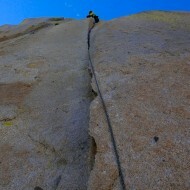 Gear: We had 2*50m ropes which is good enough since most descents are walk-offs. 2*60m ropes can be useful if you like to do really long pitches. A full rack from blue alien to blue no 3 camalot, doubles to triples of all, gives you the opportunity to climb and protect most routes. 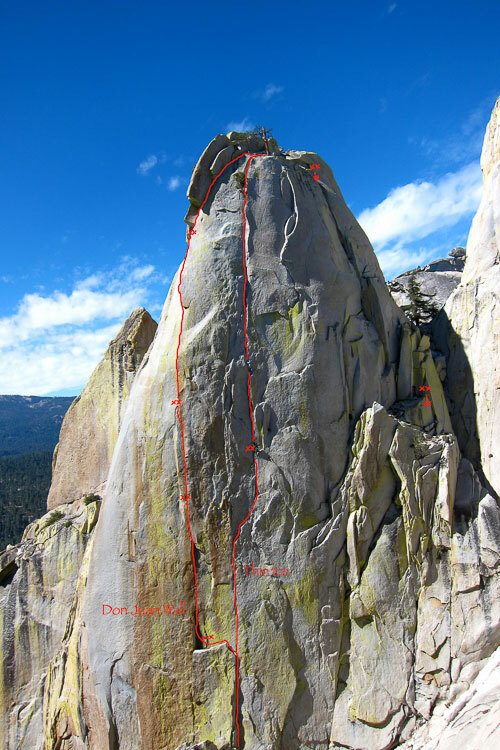 For a more adventurous day out, climb the South Face of the Warlock Needle: the longest route around (7-8 pitches), offering mostly off-width and chimney climbing (grades 5.6 – 5.8). 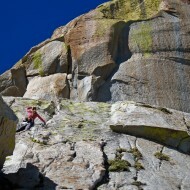 An old-style route with a remote, alpine feeling to it. You’re likely to be alone. 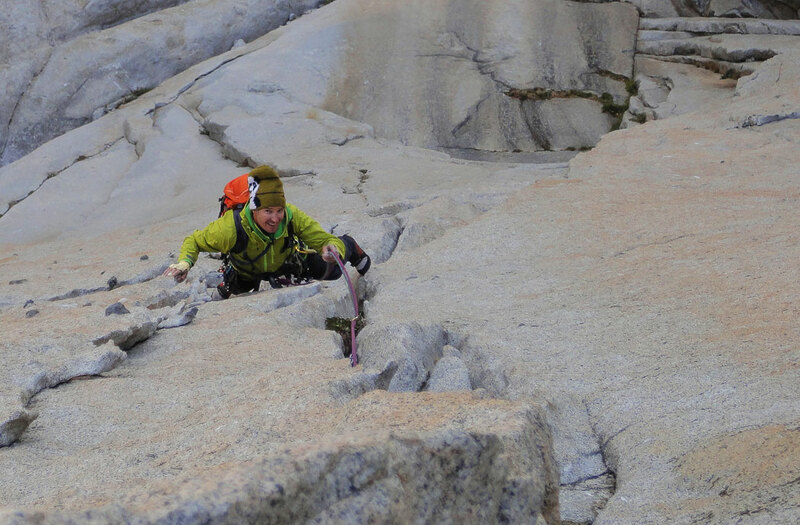 If you are not an expert on wide cracks, you want to bring at least 1 each of no 4-6 camalot, they will provide your main protections on this route. 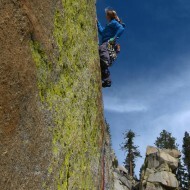 Categories: Rock Climbing and Trad Climbing Trips. 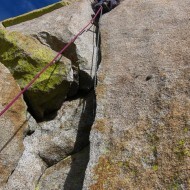 Tags: crack climbing and The Needles. 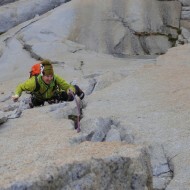 What a cool rock and mountaineering adventure, It seems like you really had fun. 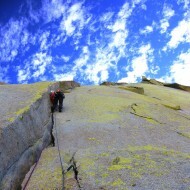 The routes that you recommend seems very interesting and challenging. I wish I can also go there and being able to experience the adventure that you had.